A powerhouse Broadway musical and enduring movie classic, Grease picks up the story of bad boy Danny and girl-next-door Sandy where their summer lovin’ leaves off: at the start of a new school year at Rydell High, 1959. Amid fast cars, teen angst, and moon-lit nights, the two discover that to remain hopelessly devoted, sometimes you’ve got to wake up, shape up, and shake it up! Injected with irresistible music and electrifyin’ dance numbers, Grease has earned its place among the world’s most popular musicals. Performance run time is approximately 2 hours, including one 15-minute intermission. Sponsored by Work For Art. Peter Liptak (Danny Zuko) is a brand new daddy and can’t believe he’s playing a high schooler… Again! Peter last appeared at Broadway Rose in Band Geeks! (Spitz); past roles elsewhere include Godspell (JC), Take Me Out (Kippy), You’re A Good Man, Charlie Brown (Charlie), Guys & Dolls (Nathan Detroit) and Once On This Island (Daniel). Huge thanks to Dan Murphy for encouraging him to continue pursuing theater even in the midst of this thing called fatherhood. Kylie Clarke Johnson (Sandy Dumbrowski) has fallen in love with the city of Portland, where she has resided for the last six years. Hailing from Redwood National Park in NorCal, Kylie is a true Pacific Northwesterner. Kylie loves pasta, being barefoot, Harry Potter, singing too loudly, gallivanting, palindromes, blackberries, corny jokes, and (of course) elephants. Kylie is a 2007 graduate of Western Oregon University. Favorite performances include: Boleros for the Disenchanted (Flora), Gypsy (Louise), Gracie and the Atom (Christa, world premiere), West Side Story (Anita). Claire Rigsby (Betty Rizzo) is ecstatic to be back at Broadway Rose playing one of her dream roles! A native of Atlanta, GA, Claire has been seen on stage in Atlanta, Sacramento, and Beijing, China. Portland credits include Molly in Band Geeks!, Angel in The Best Little Whorehouse in Texas (Broadway Rose), and Magenta in The Rocky Horror Show (Live Onstage). Max Artsis (Kenickie) is thrilled to make his Broadway Rose debut with such a timeless show and great role. Most recently, Max has appeared as Ricky in NBC’s Grimm, Cinderella’s Prince/Big Bad Wolf in Into The Woods, and as Snoopy in You’re a Good Man, Charlie Brown. After receiving a B.F.A. in Theatre Performance from The University of Michigan, Max returned to his hometown of Los Angeles where he enjoyed success in both theater and TV before being asked to move up to Portland to work as a personal trainer/consultant for NIKE. Some of his favorite roles include Marc in NBC’s Bent, Dolan in Line, Davis in Red Light Winter, and Harold Hill in The Music Man. Emma Holland (Frenchy) is thrilled to be back at Broadway Rose after last seen dancing and singing with the Teen Ensemble of The Music Man! She graduated with dual degrees in Theatre & Dance from Appalachian State University; her performing credits hail from the east coast with North Carolina Theatre, NorthBend Productions, Appalachian Young People’s Theatre, and the Broadway Arts Conservatory. When not on stage she can be found behind a sewing machine or spotlight for Broadway Rose! Sydney Weir (Marty) is thrilled to be making her Broadway Rose debut! 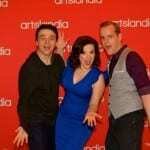 She was recently appeared in She Loves Me at Lakewood Theater Company. Sydney graduated from The Pacific Conservatory for the Performing Arts and has spent the past three years studying and teaching ballroom dancing at Fred Astaire Dance Studio. Amanda Pred (Jan) is thrilled to be back at Broadway Rose! You may have seen her as a mischevious nun in The Sound of Music or as Happy the Dwarf in Snow White and the Seven Dwarfs. Amanda is currently a senior theater performance major at Portland State University. Favorite roles include: Tracy Turnblad (Hairspray), Papagena (The Magic Flute), and Rose Alverez (Bye Bye Birdie). 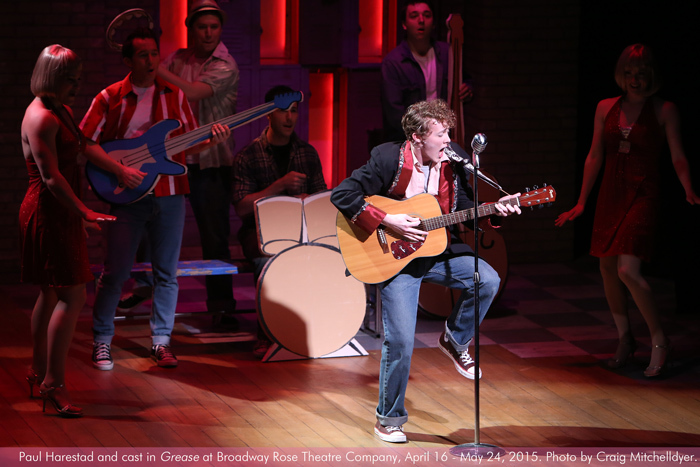 Bryce Earhart (Roger) is thrilled to make his Broadway Rose debut in Grease! Recent credits: Love is Enough at Portland Civic Theater Guild, The Skin Of Our Teeth at Theatre Vertigo, Third Rail Repertory Theater’s The Aliens (Drammy), Live On Stage’s 4×4=Musicals 2012, A Christmas Story at Portland Center Stage, Jewish Theater Collaborative’s The Loman Family Picnic (Drammy), A WWII Radio Christmas, Diary of a Worm, a Spider, and a Fly; and Sideways Stories from Wayside School at Oregon Children’s Theatre, Gypsy and Oliver! at Lakewood Theater Company, Pinocchio at Northwest Children’s Theatre, and Falsettos in Concert for Live On Stage. Bryce also wrote Mad Cow the Musical, produced at SPECTRE and triangle productions’ 4×4=Musicals 2014. Paul Harestad (Doody) recently graduated from Tigard High School where he began studying theater under the direction of Todd Hermanson. Last summer he played Marius in Sherwood Foundation for the Arts’ production of Les Misérables. He is ecstatic to be a part of his hometown theater company, Broadway Rose. Justin Canfield (Sonny) is excited to be returning to Broadway Rose. He was last seen here in the teen ensemble for their summer production of The Music Man. He received his Bachelor’s of Music in Music Education (University of Oregon) in 2010 and has since enjoyed acting in and music directing a number of shows. Some favorite previous shows have included Young Frankenstein (Ensemble, Lakewood Theatre Company), Guys and Dolls (Benny Southstreet, Theatre in the Grove), and Snow White (Sneezy, Broadway Rose), among many others. Kira Batcheller (Patty Simcox) is very excited to be making her Broadway Rose debut and to be part of such an iconic musical! She is a Portland native and a graduate from Western Oregon University with a B.F.A. in Acting. She has loved music ever since she can remember and started being part of a choir when she was 11 years old. She began her career as Marian Paroo in her high school’s production of The Music Man. Recent credits include Dreamgirls at Portland Center Stage (Sweetheart) and Young Frankenstein at Lakewood Theatre. Some of her other credits include Company (April), The Crucible (Abigail), The 25th…Spelling Bee (Marcy Park), The Liar (Lucrece), Picnic (Madge), Almost, Maine (Glory Gayle), and Oliver! (Nancy). Collin Carver (Eugene Florczyk/Teen Angel) is a cosmetologist, business owner of Gravitation, teacher, and violinist, as well as a performer. Some past roles include The Fire in Ablaze! (Staged! ), an a cappella thriller original musical that made its debut in Portland and received four Drammy awards and two PAMTA awards including Outstanding Ensemble and Best Original Musical; adult ensemble in The Music Man and Rolf in The Sound of Music (Broadway Rose), Bennet in The Temporary Man (Fertile Ground Festival), and Alfred Bell in the original and revival casts of WWII Radio Christmas (Oregon Children’s Theatre). Lindzay Irving (Cha-Cha DiGregorio) is very excited to return to Broadway Rose for the production of Grease. Previously a street urchin in The Little Shop of Horrors, she spends much of her time supporting aircraft at Columbia Helicopters as a mechanical engineer. Since performing in musicals like Thoroughly Modern Millie (Millie) and Aida (Aida) in high school, she has performed on local stages with Oregon Children’s Theatre (Snoopy, You’re a Good Man, Charlie Brown) and Wilsonville Theatre Company (Bev, Miracle on South Division St.; Gwendolen, The Importance of Being Earnest). 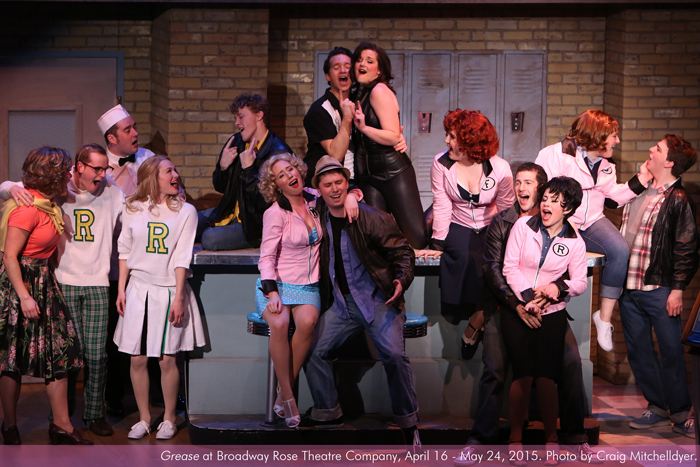 Adam Davis (Johnny Casino/Vince Fontaine) is pleased to return to Broadway Rose in this production of Grease! He has been acting in film and stage productions in the Portland area for over ten years, and has held many exciting and engaging roles, including Gaston in Beauty and the Beast at Northwest Children’s Theatre, Max Andrews in The Andrews Brothers (Broadway Rose), and Meier Wolfsheim in The Great Gatsby at Bag&Baggage Productions. He’s played on stage all over town, and has appeared in dozens of critically acclaimed feature and short films, most notably including the viral sensation Star Drunk. Adam is currently producing his first feature, Get The Girl, a romantic comedy he wrote about a veritable tragedy he went through a couple years ago. 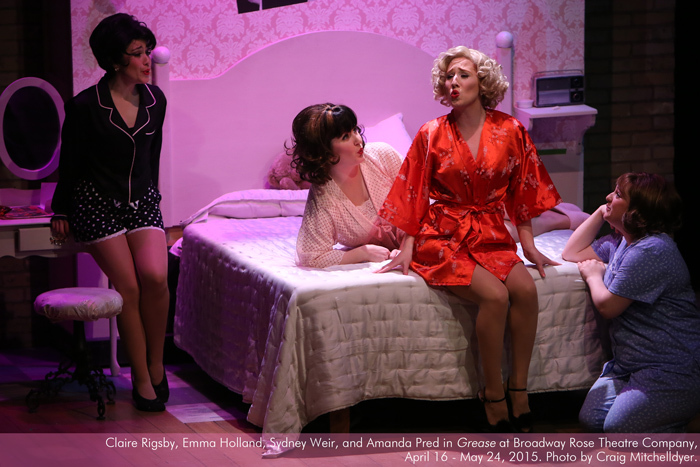 Quimby Lombardozzi (Miss Lynch) Grease marks Quimby’s seventh show with Broadway Rose Theatre Company. She is pleased to be back on stage, having last performed here as Lina Lamont in Singin’ in the Rain, one of her favorite roles. Quimby earned a B.F.A. in theater from the University of Idaho and has toured and worked at numerous companies in Idaho, Minneapolis and Portland, including a three-year stint in the Minneapolis and Portland productions of Tony-n-Tina’s Wedding where she played the irreverent Sister Albert Maria. 2015 also marks Quimby’s 10th year working behind the scenes as Broadway Rose’s grants manager. A great lover of animals, she is also a Certified Small Animal Massage Practitioner, serving the general public as well as donating her services to special needs shelter dogs, a mission close to her heart. 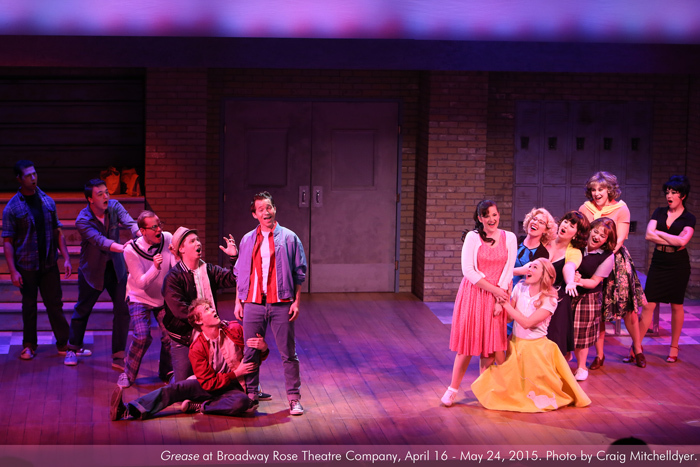 Artslandia was at Broadway Rose for the Grease‘s opening night. See the complete photo album on Facebook here. Yo Rizzo – get over here! Collin Carver steals the show as a hysterically funny bespectacled geek in plaid – and kills as an angel with a song…Read more. The cast is uniformly excellent, proving they are all at the top of their game, “a triple threat” in dancing, singing and acting…Read more. A timeless staple in the musical theater canon, it’s pretty hard to go through the world and not interact with Grease…But part of Grease’s charm is that no matter how many times you se? ?e it, you’ll have a great time. 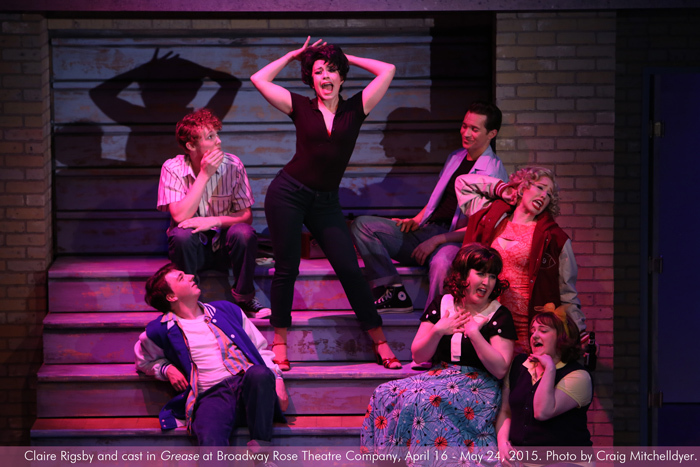 The Broadway Rose rendition of Grease didn’t disappoint…Read more. 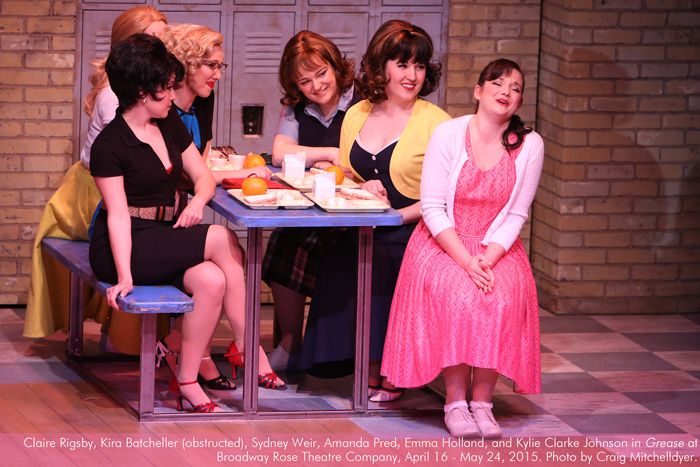 As over the top and ostentatious as you’d expected from Broadway Rose Theater, this production maintains all the Pink Ladies and T-Birds drama, plus bursts from its tiny stage with athletic dance routines. 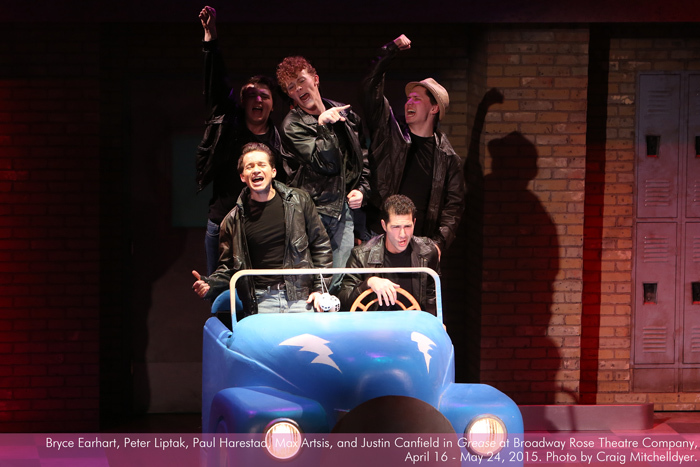 From its beginning ode to the play’s fictional alma mater, Grease gives the audience pure and simple entertainment…Read more. …there seemed to be far more songs in the stage version than the movie, for that alone it’s worth the trip to the theatre. I’d liken it to finding out that a movie you like was based on a novel you haven’t read, except that live performances are much rarer things, so when the opportunity presents itself you must jump at it while you can. And you should! 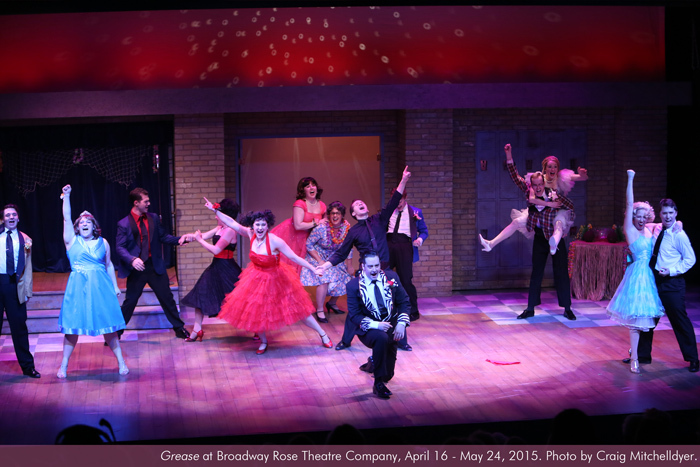 Broadway Rose’s production oozes with fun…Read more. …a production as strong as the one at Broadway Rose is a sure-fire sellout…the show’s single finest moment is unquestionably Rigsby’s heart-wrenching delivery of “There Are Worse Things I Could Do.” We’ve seen countless productions of Grease through the years, and have never seen the song performed more convincingly...Read more. It’s loud. It’s fun. The performers fill the room with energy. They perform 22 songs in two hours. The staging, set, choreography and voices are what you might expect from a professional, travelling production…Read more. 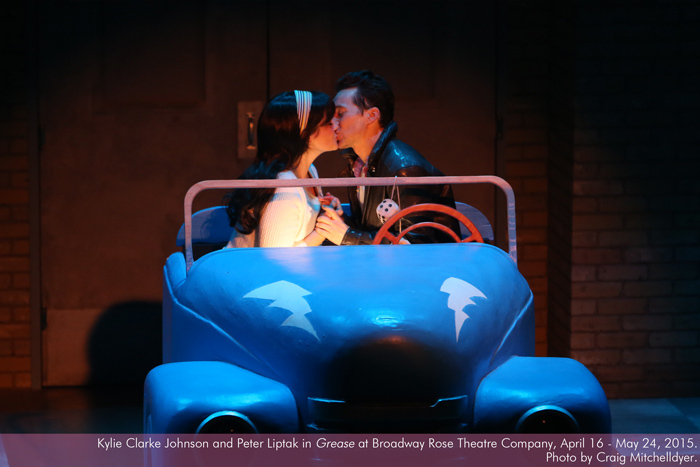 In the musical “Grease,” high school students Danny Zuko and Sandy Dumbrowski meet and hit it off during the summer of 1959, then reconnect when Sandy starts attending Danny’s high school in the fall. In real life, Peter Liptak (who plays Danny) and Kylie Clarke Johnson (Sandy) met playing ball during Softball Saturdays, weekly games popular with metro-area actors. But that’s where any similarity between the real-life actors and the make-believe couple ends...Read more. 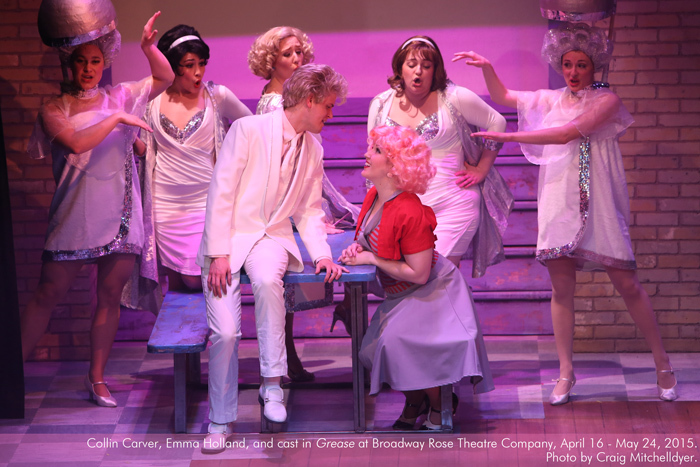 If you were thinking about getting a ticket to see “Grease” at the Broadway Rose Theatre Company in Tigard, then you better act fast: Seats are selling out…Read more.